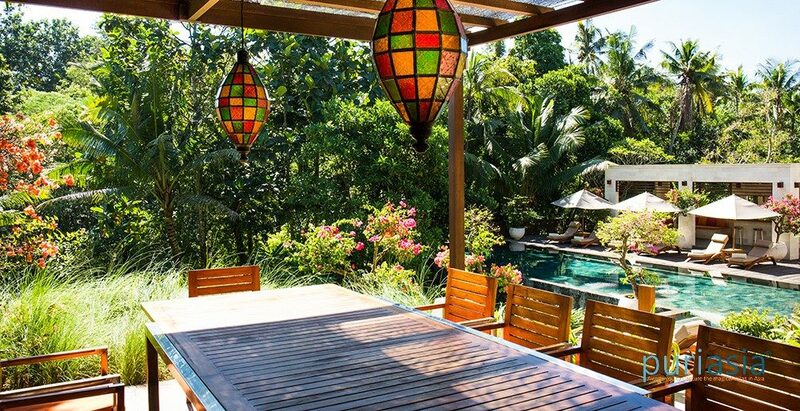 Set in a beautiful rural area of rice fields and jungle-clad river valleys in Tabanan, this splendid four-bedroom villa occupies an expansive two hectare estate flowing down a terraced hillside in south-west Bali in Canggu, within pristine Balinese gardens. 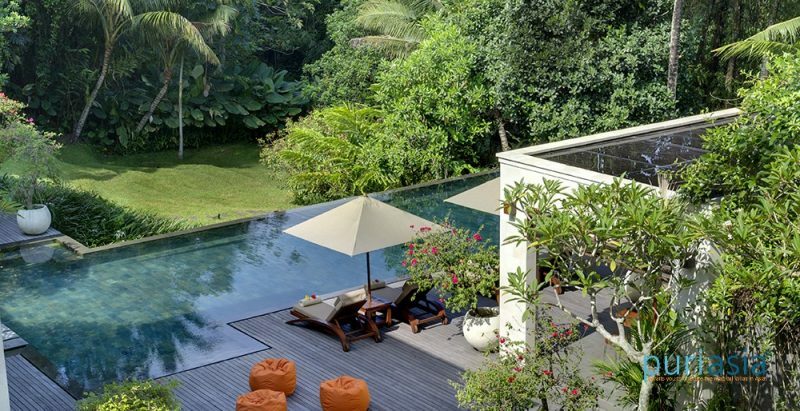 The Arsana Estate offers the perfect setting for large family and group retreats, weddings and events as it blends an exceptional location with outstanding facilities and an exceptional team of villa staff. The Arsana Estate is a completely self-contained villa, giving guests no real need to venture out at all, but a visit to the nearby village – one of the prettiest in Bali – and experience a true example of Balinese community and village life should not be missed. 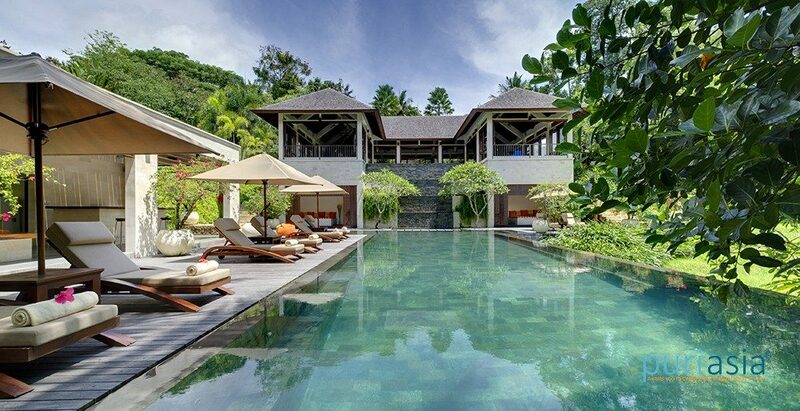 The very name of the villa describes its thoughtful layout. 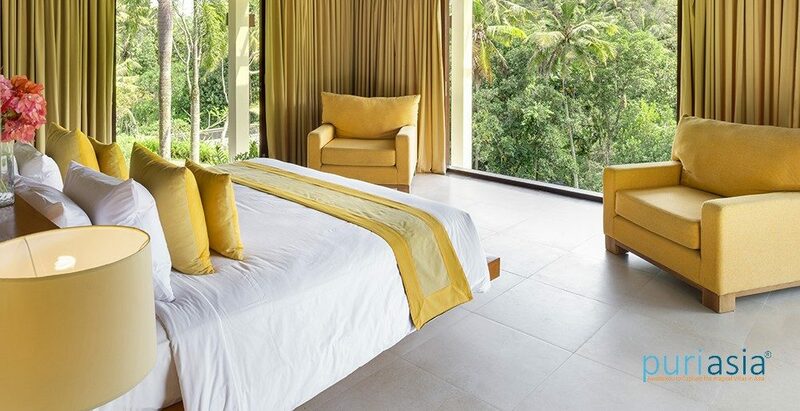 Arsana means ‘flow’ in Sanskrit, and not only does the villa’s name aptly describe the way The Arsana Estate’s individual bedroom and living pavilions cascade down the hillside into the nearby valley, but also the Sungi River that meanders past its lower boundary. Water features abound at The Arsana Estate, where ponds, water walls, waterfalls, and an 18m x 8m swimming pool with a separate children’s section will refresh, relax and delight villa guests. 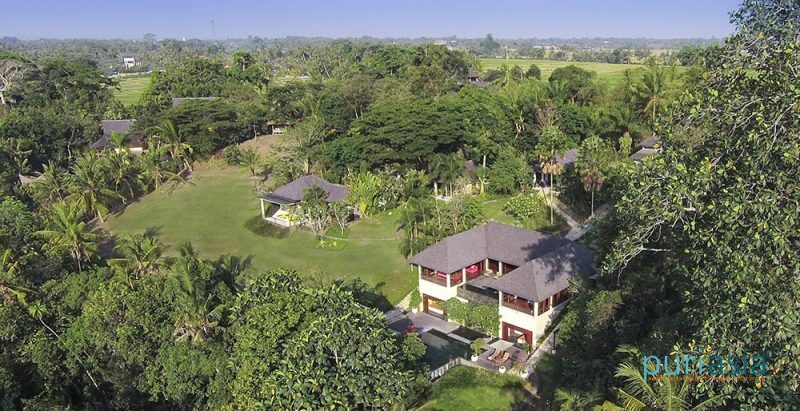 The villa also has its own tennis court and a very large green space for children. 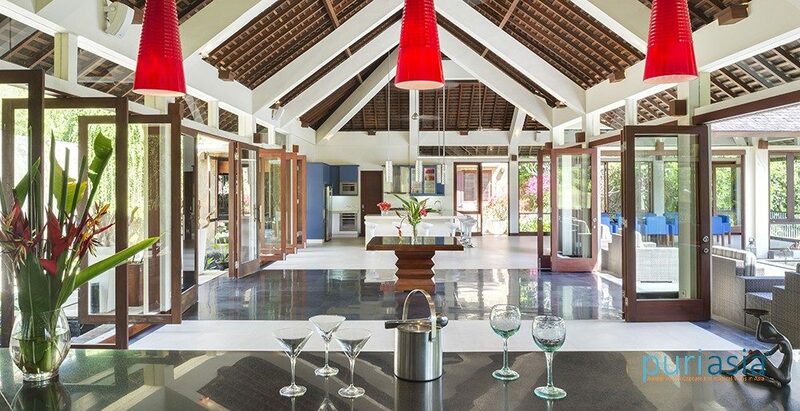 The villa’s sleek modern structures, with their ironwood shingle roofs and abundance of glass, reflect the ambiance of the location and the purity of the natural surroundings, while the interiors are characterised with a bold use of colour and luxurious furnishings. 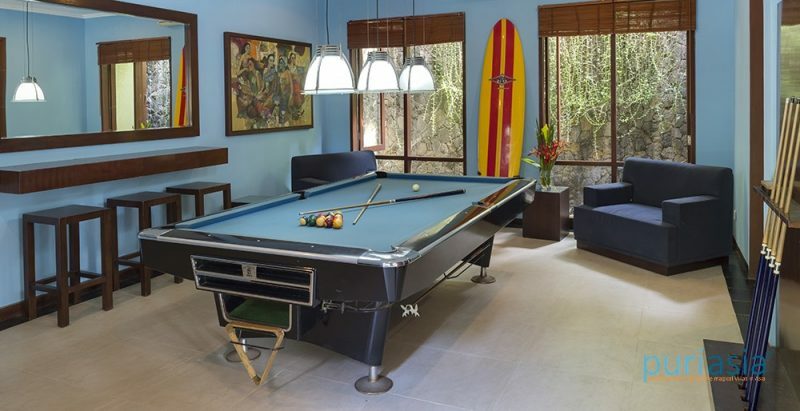 Presenting many different options for large groups to dine or entertain, the villa also has a cinema room as well as a games room, complete with a pool table. Unique artwork adorns what solid wall space there is, while the front facade of the living pavilion is an abstract notion of floor-to-ceiling glass doors and windows that remain open to the elements. The villa’s four bedroom suites, housed in three stand-alone pavilions, include a spectacular multi-roomed master pavilion and an eight-bedded children’s slumber room, spread leisurely across the terraces of the estate. Fully outfitted for families, each room has a separate day bed area suitable to sleep children. with an abundance of children’s toys, plus games and activities for adults too, this stunning sanctuary with its team of personal butlers, housekeepers and chefs, offers guests nothing but pleasure and relaxation. In the master suite, warmed by a red-hued Persian carpet, rests a king-size bed dressed in fine cotton bed linen. 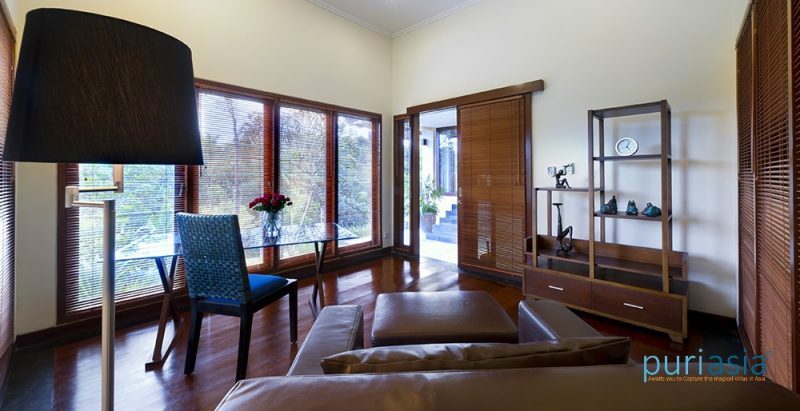 Antique lacquerware cabinets and Chinese pottery sit comfortably alongside contemporary art, lamps and leather chairs. 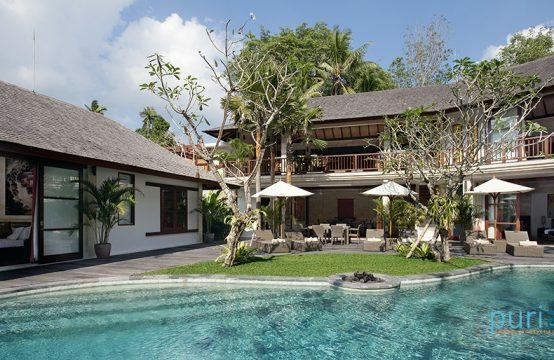 Elaborately carved Balinese double doors open onto a small sitting room where an upholstered sofa is set before a 50-inch screen with satellite channels and Apple TV. 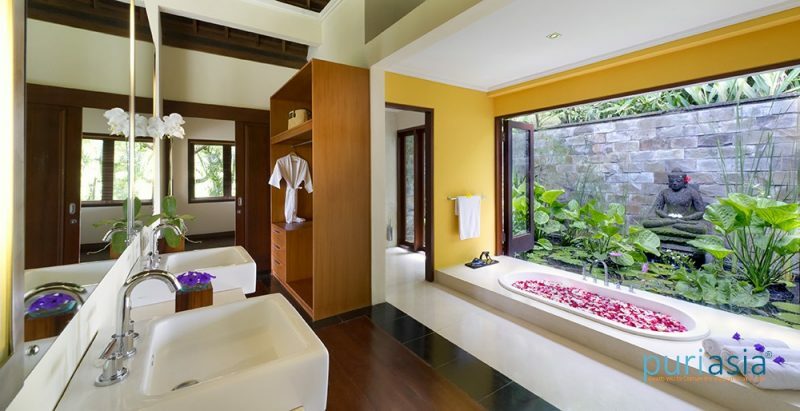 Behind the bedhead, flanked by triple-door wardrobes, an opening leads into the bathroom where the twin-basin marble vanity, walk-in rain shower and WC enclosure all look onto a private courtyard pond with water feature and Buddha statue. This suite has a connecting door to the children’s bunk room. 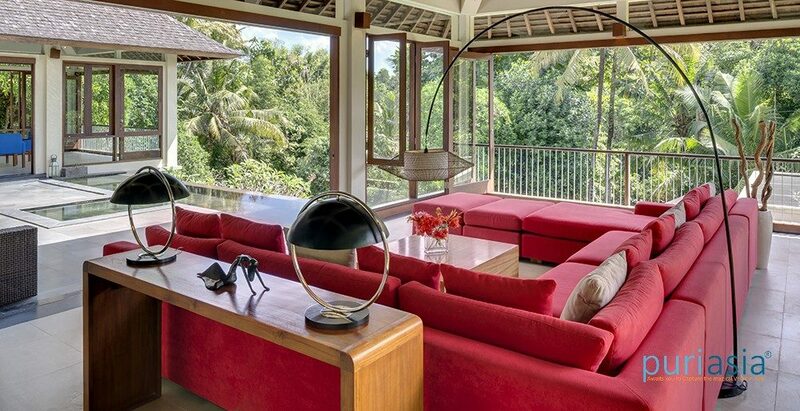 Both guest suites occupy their own self-contained pavilions, with panoramic treetop views from their private terraces. Each has a bedroom – one set up as a king, one with twin beds – and separate alcove rooms filled with deeply cushioned daybeds and 43-inch TV screens with Apple TVs. The daybed areas can be converted into children’s sleeping areas. Beyond the extensive dressing areas are bathrooms with walk-in rainshowers – and in the twin suite, a bathtub – looking onto courtyards with lotus ponds. The children’s room has the capacity to sleep eight children in considerable style and comfort. Built into the length of a bright orange wall-grey toned striped wall are three sets of bunk beds screened by curtains. Resting on a pair of contemporary black and white carpets are two twin beds that can also be configured as a king. There’s a 65-inch TV screen and Apple TV to keep the kids amused indoors, and beyond the private terrace is a football pitch and trampoline. A brightly tiled bathroom is accessed from the dressing room, where there’s also a connecting door to the master suite. Step across a lotus pond flanked by massive verdigris copper planters into the magnificent open-plan living pavilion lined with bi-fold glass doors and windows. Within this immense space – the social heart of the estate, designed for easy entertaining on a lavish scale – supremely comfortable sofas, over-sized armchairs and daybeds form multiple seating areas that flow around an alfresco sun terrace with fire bowls rising from the pond. 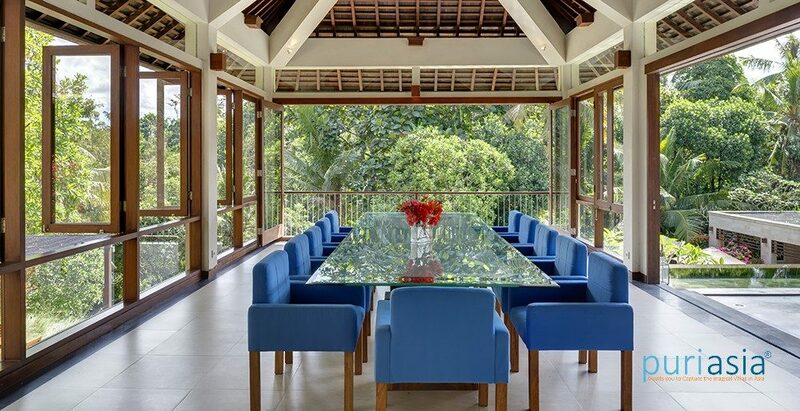 A five-metre dining table, inset with stone and surrounded by 16 armchairs, commands centre stage in one wing. Alongside is a guest kitchen, where eight woven-leather bar stools are set before a marble-topped island counter with butler’s sink and under-counter fridge; behind, a wall of latticed teakwood conceals the wine fridge, fridge-freezer and hi-tech central electronic controls. (The professionally equipped service kitchen is tucked away out of sight). To one side of the living pavilion is an air-conditioned home cinema. A bank of modular seating and ottomans faces a massive 85-inch TV screen and a 135-inch retractable projector screen – perfect for watching satellite TV channels or Apple TV movies; there’s a video library and surround-sound Sonos system and, for the kids, PS4. Also off the living pavilion is an air-conditioned games room, dominated by a full-size pool table set before a gilded triptych of bamboo stands. A pair of lacquer-ware cupboards house a welcome collection of board games and puzzles to keep all ages entertained. Down a few steps from the living pavilion is a delightful alfresco breakfast pergola with table for 10 set before a signature wall of Palimanan stone carved panels, where guests may enjoy their morning coffee and croissants under a canopy of white Thunbergia flowers. 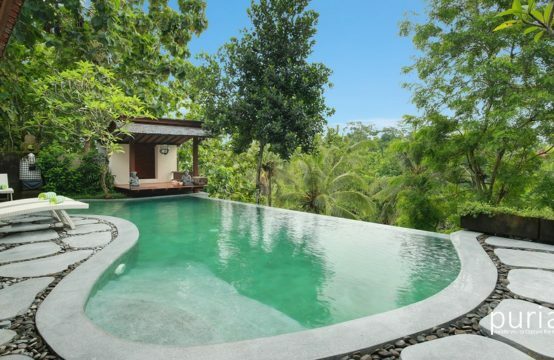 Flanking the 18-metre pool, and overlooking the river snaking below, is an open-sided living pavilion with a comfortable seating area and table for 10 set before a handsome tree-of-life relief carved from Palimanan stone. 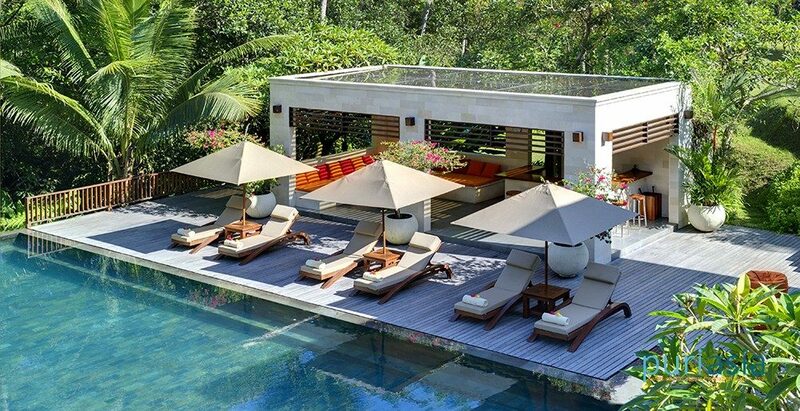 This fan-cooled area provides a shady retreat from the heat, and an alternative to the cushioned loungers resting under parasols on the two Indian stone sun decks. On either side of the water-wall cascading down from the living pavilion above are two large annexes – one fitted as a service bar area, the other as a massage space. Just below the pool and overlooking the river is a large cushioned balé. A second balé rises on Sunset Hill at the highest part of the two-hectare estate. 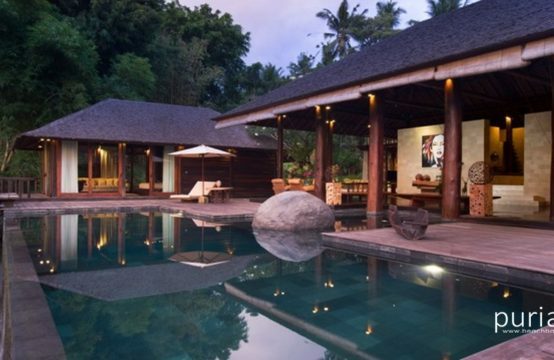 Within the Arsana Estate is a Benkirai-wood pavilion that houses a dedicated gym /yoga room. Here, resting on the burnished coconut-wood floor is state-of-the-art fitness equipment – a Concept2 rowing machine, Life Fitness treadmill and pulley weights system. A wall of glass leads onto an ironwood deck looking down onto the river ravine. Elsewhere in the two hectare estate is a full-size hard-surface tennis court. 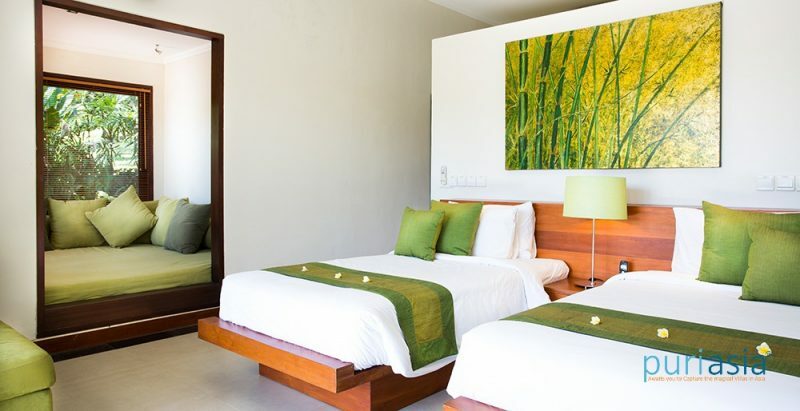 The Arsana Estate capacity 10 adults in 5 suites (1 king-size bed; 2 queen-size beds; 1 set twin beds; 1 queen-size bed convertible to twins) plus 8-12 children in large daybeds, sofa beds and bunk beds. 3 cots also available. 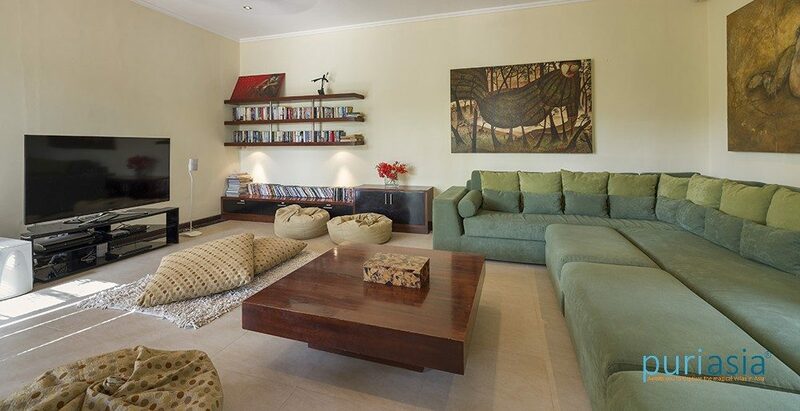 Living room; dining room with table for 12; kitchen with breakfast bar; drinks bar; games room; home theatre; two poolside massage balés; outdoor dining for 10; poolside lounge with bar; riverside balé, sunset balé; TV room in master suite; study in master suite. 16 total: villa manager; chef; cook, 1-2 butlers, 3-4 housekeepers; 2 gardeners; 1 pool attendant & maintenance man; 5 security guards; masseuse and babysitter on request. Flat-screen 60-inch satellite channel TV and DVD player in home theatre; 32-inch satellite-channel TV and DVD player in each suite; iPod docks. Trampoline; basketball hoop; flat lawn with football goal; pool toys; Nintendo; Wii; books and toys; high chairs and cots. Superb venue for weddings and events of up to 80 (standing/cocktail) or 60 (seated) guests. One car with driver for up to 8 hours at a special rate of US$ 25++/day (excluding petrol). 3 bicycles; fully stocked bar and safety deposit boxes.